Day 12 – there’s a goanna in my yoga room! I had just finished yoga for the day and was having something to eat and a cup of tea, when the Soccer Star and his friend rushed and shouted Mum! There’s a goanna in your yoga room! What? 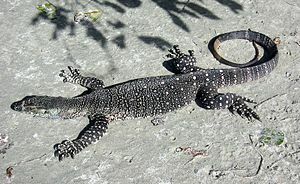 There’s a goanna in your yoga room, and it’s big, about 1 metre long! Have you told your father? Yes, he’s over there right now, trying to get it out! Can I just say, that in addition to all the benefits of living in Australia, in a beautiful rural area like we do, there are a couple of downfalls. Insects (so many insects! ), ticks, rats and mice, spiders (there are heaps of funnel-web spider holes in the backyard at the moment), snakes (we had a black snake and a brown snake visit us a couple of weeks ago), and now a bloody goanna has made its home in my yoga room. And to make matters worse, the Bear said it had probably been in there the whole time I was doing yoga, curled up behind the book case. Ack! I am many things, but I am not an indigo-child wildlife warrior. I put up with all the animals, but love them I do not. We had a nicer visitor the night before, a friend bearing gifts of music and flowers to thank us for being there for him during a difficult time. I wanted to tell him that he didn’t need to thank us or bring us gifts, because being his friend is reward enough in itself. Those words didn’t come to me at the time, so I just hugged him and said thank you. That gesture of gratitude stayed with me today, and I kept gravitating towards it, like a warm fire on a cold night. Why don’t I put some music on from that gift while you read about the Pitta dosha, and how to balance that element in your yoga practice? Oily: Softness of skin and hair; in excess can lead to oily skin, acne or a ‘slipperiness’ of character. Sharp: A sharp, bright intellect; in excess can manifest as a sharp tongue. Hotness: Warm complexion, body, metabolism, appetite; in excess can manifest as ulcers, heartburn or a hot temper. Light: Slender body; in excess can manifest as a feeling of light-headedness if a meal is missed. Spreading: This quality can manifest as a tendency to spread your name around the place – and it can also manifest as a spreading rash! Liquid: Excess body fluids – sweat, stomach acid etc. Cultivate calm, and resist your urge to be competitive in the yoga class/room. Be gentle and patient with yourself. Avoid poses that create heat and sweating, especially in the summer. Practice yoga at cooler times of the day – in the early morning and evening is ideal. Practice chest-opening poses such as the pigeon, camel, cobra, bow, fish and bridge. If you would like to know more, go here. It’s a wonderful website with heaps of information on all things yoga and Ayurveda. I also loved the music clip to accompany my yoga reading today. We live out in the country, too, one reason we have plenty of cats guarding the house. It seems to work. I’ve been easing back into yoga slowly after hurting my back, not from yoga, almost 3 weeks ago. Certain poses have really been hard, but I’m happy this week that was able to do the camel pose again. We have a dog who has a pathological hatred of goannas – maybe she chased the goanna into the cottage in the first place, instead of up a tree which is where the goanna would normally go. I hope your back is feeling better soon – yoga is good for that too. Do you use props?